Croatia always seems to have a wonderful trick up its sleeve. Its popularity might have rocketed in recent years, but it's still delivering spectacular surprises and hidden gems. There's just so many things to do in Croatia! Slices of ancient Rome sit on the Adriatic coast, letting you eye the empire as it was centuries ago. Hopping around its islands feels like holiday speed dating, with every shore completely unique and devilishly charming! And then there's those natural wonders. The kind that leave you staring at your screen in a state of wide-eye wanderlust. Tumbling waterfalls, magnificent mountains and shimmering lakes are all just a short flight away. Ready for a road trip? Plitvice offers the purest natural beauty, just over two and a half hours from Split. Its 16 stunning lakes are so mirror clear that you'll probably see your reflection staring back. You might even be tempted to ask it who's the fairest natural sight of them all! Although you'll already know the answer. These mesmerising green and blue pools are connected by cascading falls, tumbling through the trees to fill the lakes beneath. Plitvice's wooden walkways even seem to be hypnotised by their beauty. These paths hug and follow their enchanting curves, getting you up close and personal to these wonderful waters. Aching feet might need a little break from action, so why not hop on a bus or boat? Wheels whisk you to the highest point in the park and boats glide across the largest lake, before taking you down to Croatia's highest falls. 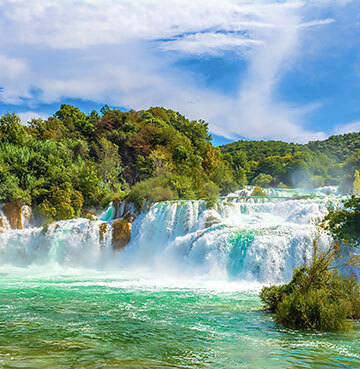 Plitvice takes plenty of the plaudits, but Krka more than holds its own when it comes to rumbling falls and blissful pools. And they're perfect if long road trips aren't quite your cup of tea. Just over an hour from Split and with a handful of our Croatian villas even closer. There's 17 waterfalls in total, but Skradinski Buk is by far the most impressive. You can even take a dip in beautiful waters at the foot of its three cascading falls – a truly spectacular sight! If you'd prefer to stay dry, just follow the beautiful paths that carve a course around Krka's falls. Visovac Island is the cherry on the cake, sitting pretty in the middle of the lake. Home to a 16th century monastery, wonderful gardens and a fascinating museum – board a boat and see it all for yourself. Grab your piece of the deserted island pie in Kornati! There's a tranquil and peaceful vibe to these islands, which remain uninhabited for most of the year. A day trip here is the perfect back to nature adventure! Hop aboard your vessel and watch as these gleaming white beacons come into view. The contrast between the rugged shores and the Adriatic Sea is a mesmerising sight. If it's those pearly whites that tempt you, hike the rough terrain and explore the coastline on foot. But if those brilliant blues have you tingling with excitement, it's time to take a dip! Calm waters seem to cling to the coasts within the islands, so swimming here is pure delight. If your holiday boots were made for hiking, then that's just what they'll do in Biokovo. There's nowhere better to tackle the trails on your Croatia villa holiday! The Nature Park is home to Dalmatia's highest peak and the second tallest mountain in all of Croatia. Leisurely hikers will love the quiet village of Kotisina, where the trails are easy and sights are plenty. There's local plant life to be spotted at its Botanical Gardens, while the fortress walls will interest history buffs. Vosac is a popular peak, just 2.5km from marvellous Makarska. If you're full of beans when you reach the top, set a new course for Sveti Jure – the highest of Biokovo's peaks. An extra two hours of trekking might sound tough, but views of Adriatic islands and glimpses of Italy add a spring to your step. You'll forget about those tired legs in no time at all. Gloriously green and decorated with dense forest, this is one of the Adriatic's most verdant and delightful islands. Mljet's salt water lakes are shining lights, beaming brightly in the National Park. Wrapped in a ribbon of lush pines, these turquoise pools are simply spectacular. If you love to stretch your legs, trails follow the trees around the Veliko and Malo lakes. Sveti Marija is sure to catch your eye as you make your way around. Sitting pretty in the larger lake, this island is home to a Benedictine monastery cocooned in more of those perfect pines. Dubrovnik may be known as the 'Pearl of the Adriatic', but Croatia's impeccable islands soon cast a doubt in your mind. Are those beautiful gemstones actually scattered along the shore? Not many countries can boast such a beautiful collection, craved by so many! Hugging the coastline, just a small stretch of electric Adriatic Blue separates many islands from the mainland. And sitting so close to the shore, it's no wonder they cast such a spell over those lured for a taste of island life. Each tingles the taste buds and senses in its own special way. Variety is the spice of life, after all! Here's just a handful but there's so many wonderful islands to discover. As the longest and sunniest of the Croatian islands, it's no surprise that Hvar is so popular. Its pebbly shores meet lush vineyards and rolling hills, but it's the towns in between that are so captivating. Upmarket yet charming, bustling but quaint – Hvar Town is an excellent choice for lively modern life, with a hefty measure of culture thrown in. Stari Grad is a path less trodden by tourists, but well felt under local feet. The 'Old Town' was founded in 384BC, so it doesn't get more historic on Hvar. And how about the island's answer to Venice? Its smallest town of Vrboksa sits pretty in a glistening bay, with bridges connecting the two sides. Good things certainly come in small packages here. From the longest island to Dalmatia's largest, sleepy villages meet jaw-dropping sights on these shores. Brac is best known for its stone, which has been carved and craved for centuries. Just ask the Romans! 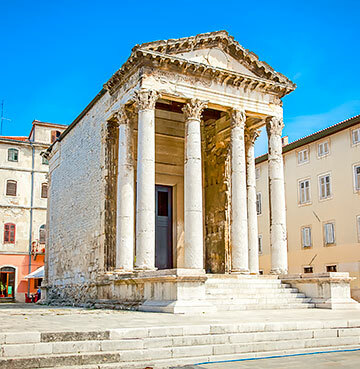 They gave it their seal of approval in the 4th century, building Split's Diocletian's Palace from Brac stone. Today it's the island's two brilliant sights that draw visitors from far and wide. 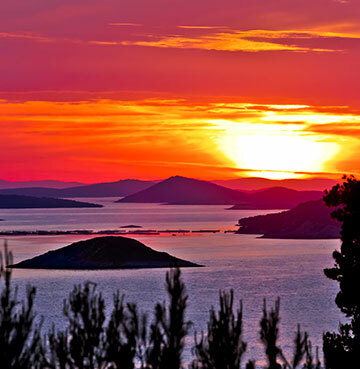 Vidova Gora is the highest point on any of Croatia's islands, promising amazing views of Brac, Hvar, Vis and more. On a clear day you might even spot Italy in the distance! Although there's one eye-catching view that will have you itching to descend – Zlatni Rat. The 'Golden Horn' is a perfect tongue of fine sand, rolling its way into the Adriatic Sea. This postcard-perfect beach has a magnetic charm, even the surrounding nature seems under its spell! The waters hugging the sand take on their own brilliant shade of blue, while the pines just inland mimic the shape of the shore. And with the sea breeze and waves shaping Zlatni Rat, it will look slightly different every time you visit. If Brac lays down the gauntlet for mesmerising waters, Vis happily accepts the challenge and delivers breathtaking blues of its own. Prepare for shades unlike any you've seen before! On the nearby island of Bisevo you'll find The Blue Grotto, where sunlight sneaks through cracks in the rock. Illuminating the water within, these turquoise tones are so beautiful it's no wonder Mother Nature has kept them tucked away. Closed to the public until 1989, Vis is about as authentic as they come! If you're craving true Croatia, a day trip here is perfect for your villa holiday. This is where narrow streets carve a course through ancient stone buildings and fishing traditions keep the catch of the day coming to your plate. 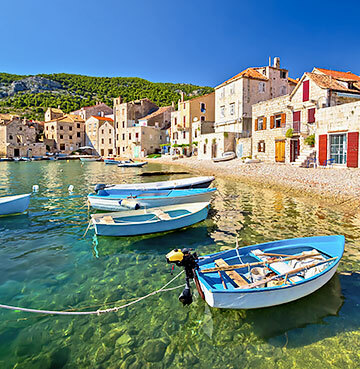 Komiza is even credited as a driving force for fishing in this part of the world! This harbour town is ideal for tucking into seafood and learning about the past in the Fisherman's Museum. Visit Vis Town and a beautiful curving bay awaits. Where better to stretch your legs, as you walk from the charming port to the buildings that show Vis as it was hundreds of years ago. Nature lovers rejoice! There's nowhere better to take a walk on the wild side. Rab feels like a fascinating snapshot of Croatia's great outdoors. A wave of natural beauty washes over the island, as golden sands melt into forest greenery and rocky mountains! More than 30 sandy beaches offer a welcome break from the pebbly shores of other islands! So feel the fine sand beneath your feet and take a dip in the shallow waters, perfect for your little ones. Paradise beach is just that – paradise. Its golden shore gazes out to the mountains in the distance, separated by shimmering seas. If those peaks are just too tempting, hit the heights with a mountain hike. Trails here wind their way along rocky coastline and through dense forests of pine and oak. Zavratnica Bay is a breathtaking natural beauty, as Rab's unique Croatian take on a Fjord. Sea blues and greens ooze into this narrow inlet, tucked between two tree-lined cliffs. The great outdoors has never felt so great. If you've not quite found your sea legs, fear not! The Krk Bridge is here to save the day. Connecting the island to the mainland, hop in the driving seat and discover Croatian culture by car. A mix of fascinating attractions and ancient monuments, all within day tripping distance. What could be better? Peel back the layers of Krk Town and historic delights wait within. Perfectly packaged in 2000 year old walls, the Old Town is a gateway to Croatian past. Its most impressive monuments decorate the main square, known as 'Kramplin'. Frankopan Castle dates back to the 12th century, when it was designed to defend Krk from conquerors. The cathedral is just as old, although it's the 16th century bell tower that's instantly eye-catching – towering over the buildings below. Sitting just off Krk's shores, you'll find Kosljun – a tiny island brimming with charm. Don't be surprised if it manages to lure you away from dry land! Although the short boat trip is more than worth it. A 16th century monastery sits among the lush trees, home to monks and a fascinating museum of art, artefacts and rare literature. Back on Krk there's plenty more treats for your artistic eye, with some even shaped by nature itself. Biserujika is less a cave and more an art gallery, proudly showing off rock sculptures, stalagmites and stalactites. Smugglers once stored their treasure here and, if the tales are to be believed, there's still gold tucked somewhere deep within. If we're talking Croatian culture and history, there's no better place to start than Pula. A little corner of Rome still stands here, centuries after its conquerors left these shores. Pula's Roman amphitheatre is one of the best preserved anywhere in the world! And if you ever needed a sign of its magnificence, this historic delight is simply known as 'The Arena'. A bold title, backed up by sheer brilliance. Walking through the limestone arches, crossing through the seats – you can't imagine a more impressive setting for a gladiatorial battle. From heart in mouth duels, to the very heartbeat of Roman Pula. 'The Forum' would have been home to public buildings and temples in times gone by. In fact, the Temple of Augustus remains a brilliant historic beacon to this day – despite damage caused during World War II. More Italian influence made its way to Istria centuries later, in the form of the Venetians. You won't find the same extravagance as Pula's Roman relics, but the Venetian Fortress shows just how vital this Adriatic stronghold was. Four towers surround the centre, protecting from the threat of past invasions. Today they're simply your lookout point for the wonderful seafront city below. It might seem like Pula is the star of the historic show, but Porec is happy to fly under the radar. This coastal delight is home to its own piece of Venetian history, with defensive walls and three 15th century towers. And they're standing as strong as they were hundreds of years ago! You'll truly get a feel for how protected locals would have felt in Venetian times. The Byzantine Basilica is another treat, oozing that historic charm. Its breathtaking mosaics date back hundreds of years and a short climb of the bell tower offers a birds-eye view of Porec below. 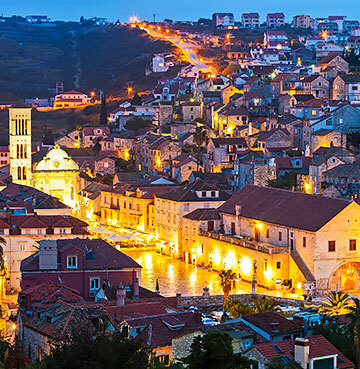 The Dalmatian Coast has a wonderful knack for seamlessly combining old with new. You'll find little pockets where the bustle of modern life wraps itself around relics of the past. Dubrovnik is top of the class when it comes to this! It's the star pupil of Croatian history lessons with a modern twist. Locals live within the walls of the Old Town here, with lively markets meeting museums, monasteries and more. Its ancient buildings have been given new life too. The Rector's Palace is now home to the Museum of Cultural History, while everything you need to know about its maritime past sits in St. John Fortress. There's no better way to take it all in than with a walk along these walls. Pick out the monuments below, admire the gleaming Adriatic Sea and even stop for a drink as you make your way around! It's a similar story in Split, where Diocletian's Palace remains the beating heart of the modern city. An impressive feat given that it put down roots here in the 4th century! Built for the Emperor's retirement, there's anything but a leisurely vibe to Croatia's second largest city. A maze of streets carve a path through Split, clinging to this wonderful monument. Its stunning gate archways sit just a stone's throw from bustling bars and boutiques. The Cathedral of Saint Domnius has stood the test time remarkably too, with the addition of its bell tower adding to its stature. Take on the steps and you'll be treated to a stunning look at the labyrinth below.